Scroll bar objects allow a numerical value to be displayed and modified by sliding. Scroll bars are nearly identical to sliders, but they look different. Text Editor, Text Display, Text List, Matrix, Image Display and Web Browser objects all have built in scroll bars that work properly in conjunction with their content, so there is really almost no reason to ever use a separate independent scroll bar. Slider objects have about a half dozen options. This option specifies the data that is to be modified by the scroll bar. You can either type in the name of a field or variable, or you can choose a field name from the pop-up menu (on the right). Panorama will also auto-complete field names as you type. Scroll bars may be one of three fixed sizes: Regular, Small and Mini. These are the only sizes available – see Cocoa Objects for more detail about the reasons for this limitation. The Minimum and Maximum values set the numerical range of the scroll bar. In this example, the minimum has been set to 0, and the maximum to 100. Notice that the values increase as the thumb is moved down (the opposite of slider buttons). 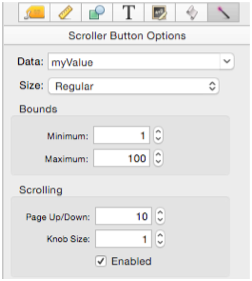 This value specifies how far the numerical value associated with the scroll bar should jump if the user clicks in the page up/page down area of the scroll bar (in other words, outside the thumb). In this example, the Page Up/Down value has been set to 10. This value controls how large the knob is in relation to the total size of the scroll bar. This option enables and disables the scroll bar. When the scroll bar is disabled it is dimmed and it can’t be clicked on. Of course there is no point in a scroll bar that is permanently disabled. So normally you would enable/disable a scroll bar with a procedure. See Push Button Objects for an explanation of how a procedure can enable/disable an object. 10.0 Updated Carried over from Panorama 6.0 from Text Display SuperObjects, but with many new features.